Demystify the application of lean in your business. A common statement heard across Australia. Yet Japan has successfully applied lean in every corner of industry. It is a case of understanding its right application in the right situation – not a case of making a round peg fit into a square hole. Shinka Management partners with the Australian Industry Group and Japan Management Association Consultants to bring you the lean essentials. This is a one-day intensive overview with practical components. It demystifies the fundamentals behind how lean can be applied to YOUR business. Lean consulting legend Yoshi Makino will share his know-how for the first time with the Riverland. 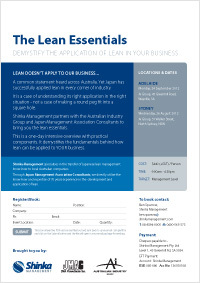 For further details and registration, please see The Lean Essentials registration form. The registration form is an interactive PDF and can be filled out and sent back to us via email. Alternatively visit our Contact Us page.